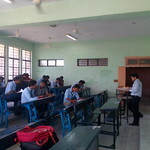 A Quiz Contest was organized by the Training and Placement Department of RGGI for the students of B.Tech. More than 150 students from various Engineering branches participated in the contest on 9/9/2016. 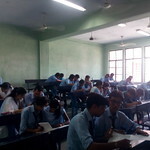 50 questions on reasoning and GS were given in the quiz. 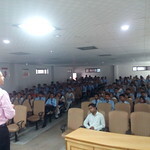 After the quiz, Mr. Puneet Dublish delivered a lecture to the students. 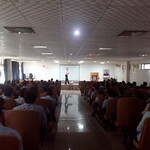 Students were told about the required skills in the industries. How bookish knowledge is differ from practical experience? What are those industrial skills which are extremely required at present? It was a very interactive and informative session .Students were interested in knowing more and expanding their personality, which added a lot of satisfaction. 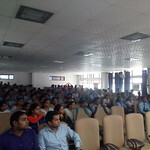 This session has increased the college visibility and also students knowledge. 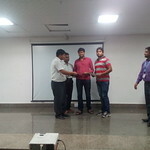 Prof. P.K Singh, Director RGGI distributed the first prize of Rs. 5000 cash and certificates to Rahul Raj Mishra and Milind Tyagi. 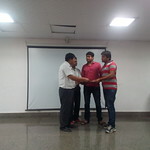 First runner up team consisted the students of EC Saumil srivastava & Prince Singh (ME). Participation certificates were given to every student. The faculty members Mr. Jay Kumar, Mr. Arvind Kumar, Dr. Riju Pawar,Mr. Manish Jaiswal, Mr. Puneet Singh, Mr. Vikas Bhardwaj, Ms. Vijaya Singh , Ms. Dimple Kapoor, Mr. Est Dev Patel, Mr. Vipin Sharma and Placement team were present there in the entire event.